Try telling someone you are going to Oregon and they'll look at you and ask - "I thought you said we'd get together for pizza later" or "which airline are you flying on?" Visiting Oregon, Illinois is a nice way to spend a day out of town. Now that fall is setting in, you can take advantage of a brisk fall morning and stare at the hawks gliding above as you peer into the skies. The treelines will soon be carpets of fall foliage lounging throughout the heart of the Northern Illinois landscape. There is a wonderful authenticity to the outdoors. Trees are beautiful with large swaths of color dotting the horizons every which way you look. The skies are dripping gold, orange, red, burgundy and assorted other shades of bountiful color. There is a tremendous richness to the season we are approaching, but taking a trek to Oregon is lovely at any given point in the calendar year. If you are coming out of the city center you can reach Oregon in 1:45. Seriously, get yourself onto the I-88 corridor and you will have yourself a lovely scenic drive. We took I-88 to Route 39, but you can drive along surface streets the entire way if you choose to spend a bit more time resting and relaxing on the drive. Once in Oregon, you have to head to the 48 foot tall statue erected in honor of the Sauk chief, Black Hawk. The statue has absolutely nothing to do with the Chicago Blackhawks hockey team outside of the name. Having said that, this would be a unique way to share a bit of fun with some of your fellow Blackhawks fans. The statue stands proudly along the gorgeous Rock River in the Lowden State Park. Think, lots and lots and lots of trees. There are some paths to walk and the State Park is surrounded by several city parks that offer the comforts of rest and relaxation. The statue is listed repeatedly as just "the statue," so don't look for Blackhawk signs anywhere. Some people will refer to the statue as the eternal Indian statue. The statue was dedicated on July 1, 1911 and it is part of the U.S. National Register of Historic Places. 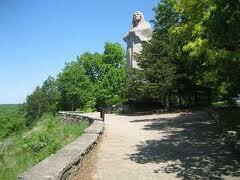 Lorado Taft was the sculptor. The town is small, but we let the local Dairy Queen source us with calcium and we walked along the town's blocks and witnessed a gigantic war memorial and a non-descript tribute memorial to the nation's 35th President, John F. Kennedy. Take your car, bring your bikes and go to Oregon, Illinois for a memorable day trip. The town is easily accessible from all points whether you are coming in from Chicago, Southern Wisconsin, Southeastern Minnesota, Iowa or the Illinois towns that surround the area. Ogle County is one of the smaller counties in the state of Illinois, but the town of Oregon offers up some amazing architectural specimens, so enjoy the art of the buildings. This is a pleasant way to spend a leisurely Saturday or Sunday.